Cable is dead! No, wait. Cable is adapting to new market realities! Here are some of the winners in that macro trend, vintage 2016. Let's dig into the cable industry. Image source: Getty Images. Rumors of the cable industry's death may have been exaggerated. Looking for evidence? 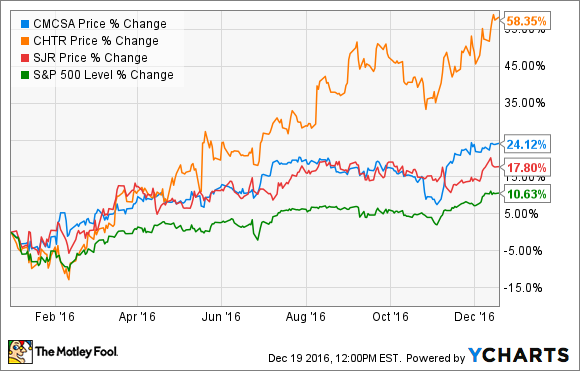 Comcast (NASDAQ:CMCSA), Charter Communications (NASDAQ:CHTR), and Shaw Communications (NYSE:SJR) have all beaten the market in 2016 by a wide margin. What's going on here? Let's find out. Charter's rise is easily explained. The company acquired Time Warner Cable and Bright House Networks in May of 2016, instantly quadrupling its broadband and TV subscriber numbers. In an industry where economies of scale play a major part, Charter made the leap to the big leagues. Management is making the most of this opportunity, rebranding its services under the Spectrum banner. Share prices soared 25% higher in the first half of 2016, adding another 27% since July 1. Comcast is always the elephant in the room. America's largest cable system is married to a massive content portfolio thanks to the 2011 acquisition of NBC and Universal Studios. The company has delivered solid quarterly results all year long while many rivals have floundered. In particular, Comcast added 170,000 video subscribers over the last four quarters. That's a breath of fresh air, as other TV broadcasters continue to lose subscribers, and Comcast itself broke a negative long-term trend here. Shaw is more of a turnaround story. Canadian cable broadcasters have generally not been good investments over the last five years, even if you account for their generous dividend policies. Shaw shares may have climbed 23% year to date, but only after closing out 2015 with a 16% plunge. The $1.2 billion buyout of wireless carrier Wind Mobile was not welcomed by Shaw investors back then, although Canadian cable companies have bought several smaller wireless businesses recently. The winners in the U.S. cable market are indeed paddling against the current, and many smaller broadcasters struggle to stay afloat. The market seems ripe for even more consolidation, with major players like Comcast and the remodeled Charter gobbling up the weaker hands. Similar trade winds are blowing across Canada, but the big winners are less obvious there. Shaw's strong 2016 showing was just a bounce off a too-deep discount at the end of 2015, and I'm not at all sure that the positive trend will continue.